New Delhi, Oct 30 (IANS) The Congress on Monday said it will observe November 8 as “Black Day” with country-wide protests against demonetisation with the theme “Bhugat Raha hai desh” (the country is suffering) and will not rest till “inherent flaws” in the Goods and Services Tax (GST) are resolved. In another meeting on GST, Rahul Gandhi, Former Prime Manmohan Singh along with P. Chidambaram and Jairam Ramesh and finance ministers of the Congress-ruled states examined the “mess created by the Modi government on account of inherent flaws in the design, architecture and rates of the GST”. “The meeting decided that Congress leadership and Congress finance ministers will espouse the pain and suffering of MSMEs, shopkeepers, traders, housewives and common man, both inside and outside GST Council,” said Congress spokesperson Randeep Singh Surjewala. “Congress will not rest until a resolution of these issues is done by the BJP government to the satisfaction of business and services,” he added. 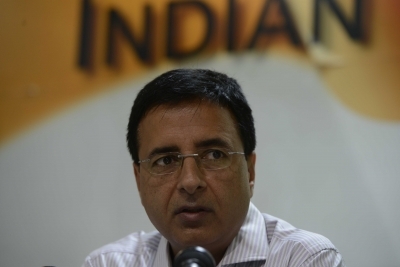 Briefing reporters, Surjewala said demonstrations will be held in every district and state capital on November 8, the day the Modi government decided last year to junk Rs 500 and Rs 1,000 currency notes. “Bhugat Raha hai desh” is the common theme of the Congress and other opposition parties. Surjewala said demonetisation “was the biggest scam of the century” and that GST had “crushed businesses and wiped out jobs”. The party general secretaries will be present on November 8 in all the states. The party workers will hold rallies and protest march across all state and district headquarters in the morning and will also hold a candlelight march in the evening. “A government drunk with power and blinded by arrogance has the audacity to celebrate the surgical strike on India’s economy,” said Surjewala. Surjwala asked: “Who is responsible for the death of nearly 150 ordinary citizens who died in bank lines? Who is responsible for the utter confusion and consequent losses caused by repeated change of demonetisation rules by RBI on 135 occasions? Who is responsible for loss of over 3.72 crore jobs on account of demonetization in MSME sector alone? Who is responsible for loss of entire savings of crores of housewives done over a lifetime? “Who is responsible for crash of business of small shopkeepers and small and medium enterprises on account of the impact of demonetisation? Who is responsible for contraction of GDP from 9.2 per cent to 5.7 per cent resulting in a loss of over Rs 3 lakh crore?,” asked Surjewala. “The meeting noted with grave concern the fact that GST compliances in its present form have become impossible for shopkeepers, traders and businesses, wiping out their life’s earnings.